It has often been emphasized to me that the death Jesus died for each of our sakes was the most physically excruciating death humanly possible. And yet despite that, the greatest agony of all was the separation He would have had to have felt from His Father because He was laden with every sin ever committed in all human history. Think of the weight you feel from ONE sin, but He carried every single one of yours, and every single sin of every other person ever to exist. Such weight, and oh, the loneliness. One beautiful thing about Christianity is that each one of us suffers so much. But that suffering can be a reminder of what Jesus did for us, and it can help us appreciate how much He went through because He loves us–even though we can NEVER understand just how much pain He endured on our behalf. Recently I heard in a homily how Jesus had to EMBRACE His suffering in order to live out His calling on earth. And we’re called to be like Him, so that means we need to as well. But by doing so, we can be closer to Him. We have to suffer anyway. Why not make it something that helps us to understand Jesus a little better, to get to know Him and draw close to Him? Even if it’s as simple as “Thank you Jesus for this chance to appreciate what You did for me.” And to use it as a time to just be with Him. That is making it all worthwhile. 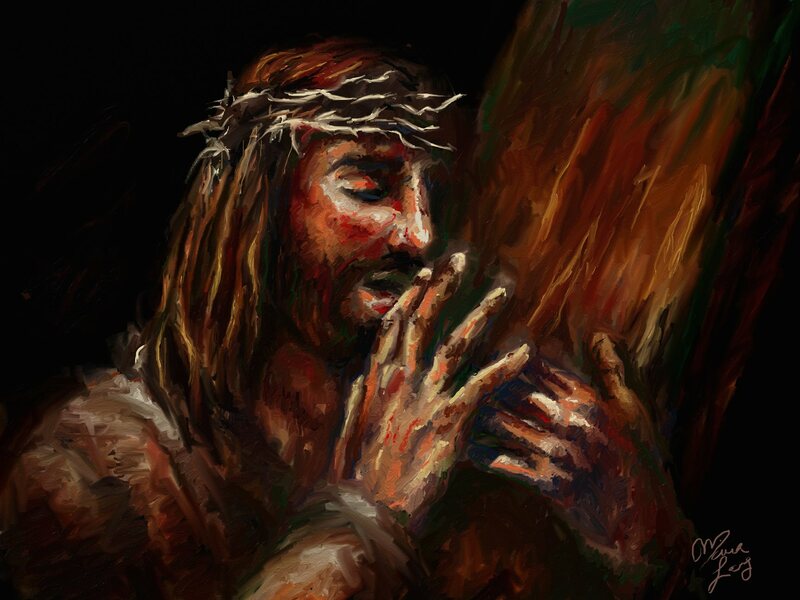 In this painting, I wanted to emphasize Jesus embracing His cross, surrounded by the darkness of that loneliness and sin–but knowing that by embracing His suffering, He’s bringing about healing and redemption. We can’t always see that light in the midst of the hard times. But we can remember this.